What benefits increase employee loyalty and engagement? Offering the right benefits and incentives is critical for companies looking to attract and retain the best employees. Our Workforce 2020 surveys show that competitive compensation is the most important benefit for employees, followed closely by bonuses and merit-based rewards. Not only do employees say competitive pay is important–they also say more money would increase their loyalty and engagement with their current company. But cash isn’t the only benefit that’s important to employees. Respondents also likely say career development, training opportunities, and a good work environment play a part in their loyalty to the company. The 2020 Workforce will be increasingly flexible. An increase in the number of non-payroll positions for consultants, intermittent employees, and contingent workers is forcing change on companies. While executives know this will force change on their companies—42% say it is affecting their workforce strategy—they will need to put more thought into policies around compensation, training, and flexible work. To do this, HR management will need an accurate picture of their flexible workforces. Currently, only 39% say they have ample data about their workforce, and only 42% say they know how to extract meaning from the data they do have. You can read more about the contingent workforce—and what it means for companies—in our research report, and we will drill deeper into the topic in a think piece and infographic to be released in the next month. Stay tuned. What matters most at work? Executives say they value loyalty and long-term commitment ahead of employee attributes like leadership ability and even job performance. Yet they are not doing what they should to foster loyalty among employees, particularly in regards to the benefits and incentives that are most important to their workforce. When it comes to satisfied employees, cash is king. Competitive compensation and bonuses/merit-based rewards rank highest among employees—other benefits are far less important. 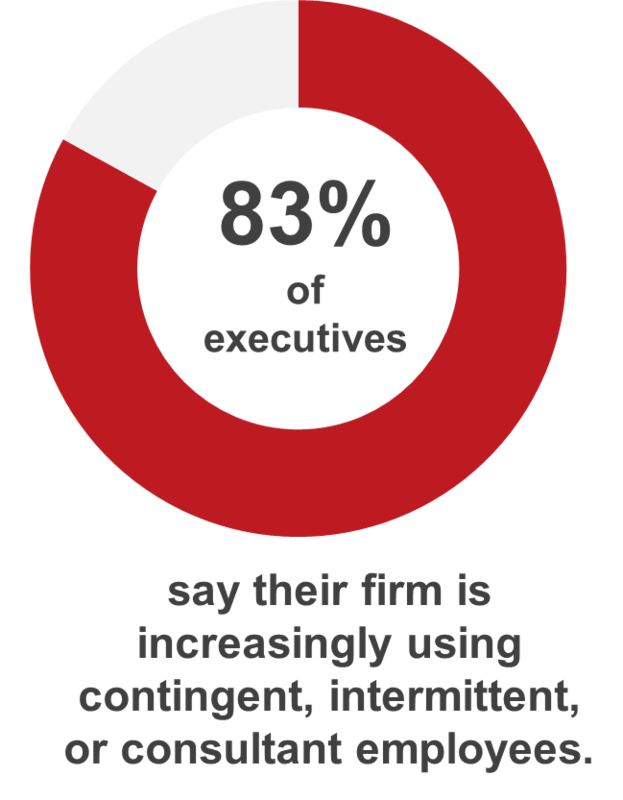 But only 39% of executives say their company offers competitive compensation. Some companies may be focusing their efforts incorrectly. Headline-grabbing amenities like recreational facilities and laundry services are not highly important to employees—only 39% say these amenities are important, and companies may want to rethink spending money on them to better focus their engagement efforts. If executives want employees to demonstrate commitment to the company, they should make an effort to determine which benefits are most important to them. The loyalty that they will engender as a result will likely have sweeping effects on talent development and succession planning, ultimately leaving companies better-prepared for the future workforce. Over the past few months, we have been talking about the national and company approaches to parental leave policies—in particular, how these policies affect women’s wages and participation in the workforce. Most companies have not yet figured out how to develop the right policies for employees with children—the same is true for determining paid maternity and paternity leave. Combating the gender pay gap will require not just an overhaul of policies, but a change in mindset. According to our survey, the need for employees with technology skills in areas like analytics, cloud, and programming will increase over the next three years. What does it take to attract top talent that meets companies’ increasingly tech-based needs? A recent article from CIO magazine talks about some of the ways tech firms are trying to recruit elite developers. The top tactic? Money—and at many companies (mostly those based in New York and Silicon Valley), a lot of it. What will happen if compensation turns out to be only a temporary fix for retaining talent? How important is personal satisfaction with work when the excitement over creative perks and compensation wanes? Our survey looks at these issues and more—we’ll have answers about the benefits that matter most to employees, along with data on what companies are actually offering, in the next few weeks. Employee pay and income inequality are big items in the news recently—rising awareness of the issue (thanks in part to Robert Reich’s documentary, Inequality for All, and Elizabeth Warren’s recently-released A Fighting Chance) has sparked debate in the US Senate over upping the federal minimum wage. Yesterday, Seattle Mayor Ed Murray announced a plan to increase the city’s minimum wage to $15 in an effort to address the widening wealth gap and set an example for the rest of the country just a day after a plan to raise the federal minimum wage was killed in the Senate. Most of the vocal enemies of the pay increase are talking about the negative consequences for businesses, but companies should also be thinking about increased compensation as driver of competitive advantage. Will better-paid employees be more engaged, more loyal, and more productive? Compensation is a big part of worker attraction and retention—and we’ll be measuring how it stacks up against other benefits in our surveys.